In this conference with third-grade student Jeffrey, Beth Lawson helps this young reader think through the importance of developing stamina to get through the first 50 pages of a book. Beth connects the conference to a wall chart the class developed earlier in the year. 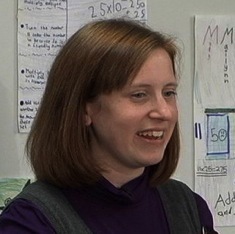 Beth Lawson worked for over a decade as a grades 3 and 4 teacher in the Evergreen (Washington) School District. She is currently a literacy coach. At the beginning of this book club, Beth Lawson checks in with three students about their character studies in the book Because of Winn Dixie. As they prepare to have an independent conversation, she offers them a suggestion to get started. Beth Lawson confers with a third grader about her book about Blues singers. The student is keeping track of important ideas on sticky notes and has quite a collection. Beth makes suggestions about ways to organize all the notes. 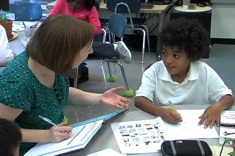 Beth Lawson works with an English language learner writing his first sentence, School is over. Using tools of an alphabet chart and the strategy of stretching it out, this student works through the sentence with Beth's support.